Because Greenville, SC (where I live) was historically a town filled with textile mills, the relics of those old mills are found in every vintage shop around- thrift shops, too. And repurposing those relics is a favorite pastime- including these vintage wooden bobbins. Because they were on the smaller side, I had an idea to turn them into unique Christmas ornaments ! The perfect size for DIY ornies! What do you think- will these vintage wooden bobbins transform nicely into unique Christmas ornaments? I have a sneaking suspicion that they will, so let’s find out if I’m right. This post contains affiliate links for your crafting convenience. The first step was to paint the vintage wooden bobbins with an “undercolor”- I chose shimmery gold and silver. Once I had properly “waxed on”, I painted the vintage bobbins again in a brighter “overcolor”- a chalk paint red and turquoise blue. I absolutely love the color combo of a bright poppy red and an aqua or turquoise at Christmas time (or any time, really). Once my unique Christmas ornaments dried, I took a little sandpaper to each spindle and “distressed” it- definitely out of my crafting wheelhouse, but not too shabby. I love a good punny. Post-distressing, I buffed finishing wax over my unique Christmas ornaments which will preserve my paint job and protect the ornaments like a top coat. I also I needed to add some sort of top to each ornament. And you know what? Save the ornament caps from any glass ornaments that break! You can reuse the caps in your DIY ornament craft projects. And this unique Christmas ornament project is definitely no exception! I added some super glue in the top hole, stuck the topper in, and then propped up each vintage bobbin in an antique bottle so they could dry right-side-up. Once everything dried, I had three delightfully unique Christmas ornaments from my vintage wooden bobbins!! Perfectly shabby, perfectly repurposed. They look even better hanging on the tree- like festive icicles! What a fun craft project this was! 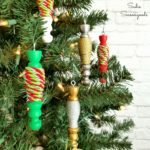 I’ve had fun turning these vintage wooden bobbins into unique Christmas ornaments- but small spindles or wooden finials would work as well. In fact, there are probably endless possibilities for creating rustic Christmas ornaments from upcycled, unexpected vintage elements like these! Please check out my full collection of upcycled Christmas projects for even more festive inspiration! Sarah, these are adorable! I love chalk paint, although, I’ve never used it crafting. 🙂 Found you on the Your Turn to Shine link up. what a cool idea! The local scrap exchange has some of these and similar, I wondered what they were for! I love these cute vintage spindle ornaments!! My grandma has a few ornaments from when she was a little girl and these kind of remind me of them. Thanks for sharing at Your Turn To Shine!! What a clever idea. I have a couple of these smaller ones so maybe they too will become ornaments. This is such a great idea! Thanks for linking up to the Home Matters Linky. Oh my goodness, how adorable! I love them! Hopping over from Prodigal Pieces…LOVE these ornaments! Be blessed! Congratulations for being published. Since I live just down the road a piece, I find tons of the spindles. This is a lovely idea – of course I love the distressing! Thanks for sharing it at Make It Monday.